A father of two and grandfather to six, Jim Mangold lives with his wife, Cheryl, in Callahan, Fla., a small community outside of Jacksonville. It’s safe to say Jim and Cheryl know everyone in town. You may not have heard of Callahan before this story, because in the last census, Callahan’s population was reported as just 200. “Our town is one square mile, that’s all it is. But the heart of this town, it’s probably ten miles square because the heart in this town – it’s just something else,” Jim shared. As Jim battled kidney failure, the town of Callahan came together in unexpected ways. Jim, a man of deep faith, expressed that without the loving support of his family, church and community, he’s not sure where he’d be. To others, it’s obvious why Jim is here. Here’s his story. What started with a routine physical for Jim in 1996 morphed into a twenty-two year battle with kidney disease. After learning he was at risk for kidney failure, Jim began making the diet and lifestyle changes necessary to keep his kidneys healthy. Nevertheless, by 1998, his nephrologist said he would need a transplant or dialysis to survive. After just 45 days on the transplant wait list, Jim received a new kidney. It wasn’t all smooth sailing though. For that first year, he was constantly sick as his body battled rejection. Eventually, this transplant failed, and he was back on the wait list. After receiving a second transplanted kidney, it seemed clear to the people who knew Jim that he had a special purpose he still needed to fulfill. Throughout his health trials, Jim remained positive and hopeful. And everywhere Jim went, his compassion was contagious. About two years ago, as Jim was volunteering at his church in Callahan with his friend, John, he opened up about his kidney disease. Unfortunately, complications from this transplant caused Jim to catch a disease known as BK Virus. The BK Virus acts like a common cold, but for organ recipients who take immunosuppressant drugs, the virus can present many complications that could lead to the transplanted organ’s failure¹. John, touched by Jim’s vulnerability and declining kidney health, continued to check in at least once a month to see if he could be Jim’s living kidney donor. But by 2017, Jim had to begin dialysis treatment again, this time with the help of the specialists at Dialysis Clinic, Inc. While Jim adjusted to life on peritoneal dialysis, his friend John began the testing process to see if he could be a kidney donor. Although he was not the same blood type as Jim, he was hopeful that he would be able to do a paired living kidney donation. However, John soon learned he was unable to be Jim’s donor because of a cancerous tumor on his kidney. Had he not began the screening process, he may not have found it until it was too late. Both men took this new development into consideration and decided it was a blessing he got tested. John needed to get surgery, quickly, and Jim knew that meant his friend would be without work for 6-8 weeks while he recovered. Even though Jim still was searching for a donor, he sprang into action. He and his wife planned a spaghetti supper for John. The church paid for the pasta and salad, and everything from auto parts to beauty parlor auction items were donated by Callahan business owners and community members. 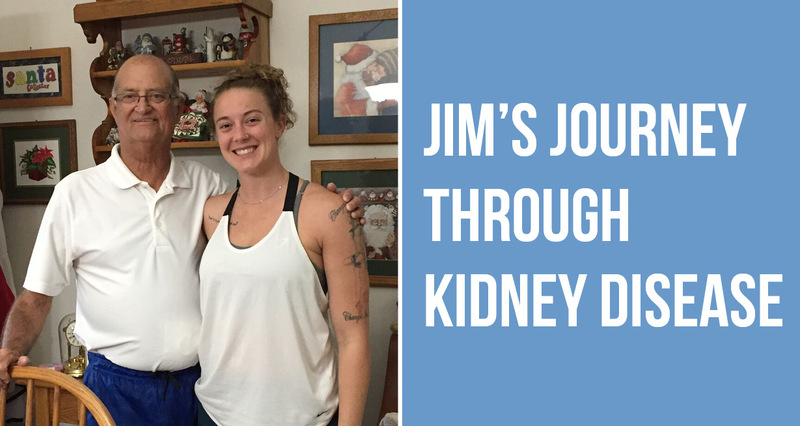 While Jim was busy focusing on John’s spaghetti supper, his granddaughter, Allyson, continued to share on social media about her grandpa’s quest for a kidney. Through friends of friends, a potential donor, Sarah, reached out. Jim said it took Sarah “about eight minutes” to decide she was going to donate, after learning she was the same blood type. She passed her tests and after some delays, the date was set for July 27th, 2018. This date did not feel like a coincidence to Jim. Jim admits the last year has been a rollercoaster for his wife and him. He had to undergo operations on his neck and heart. He also broke his femur while preparing for a hurricane and had to get another surgery for his peritoneal tubes to be placed. But through it all, his faithfulness in God to take care of him was evident. And last Sunday, a special meeting took place outside of church. John, Jim and Sarah had the opportunity to attend church together and share a moment discussing the events that led to how their lives were all interconnected. Jim’s story is a reminder that each day in it of itself is a miracle. Each day, we have the opportunity to spread joy and serve others. We never know how our actions and decisions may impact one another.